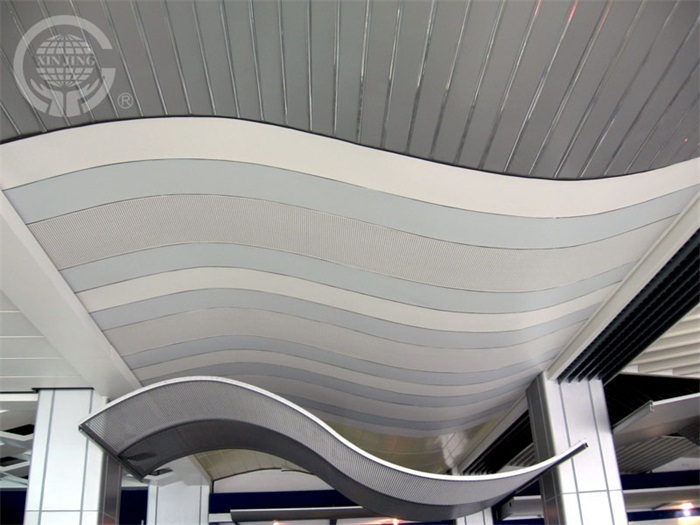 The design of the new King Arc metal strips mainly uses the principle of magnifying scales and telescopic gates, so that the ceiling of this design has a scalable form, which can be widely used in various environments, metal ceiling shape structure, round , coconut arc type, shaped ceiling decoration and trimming, to solve the decorative industry in the shape of decorative works often due to molding ceilings, trimming angle can not bend and other headaches, and can use the design of the unique retractable form, so that after application of metal strips Shaped ceiling reaches arbitrary arc curvature. 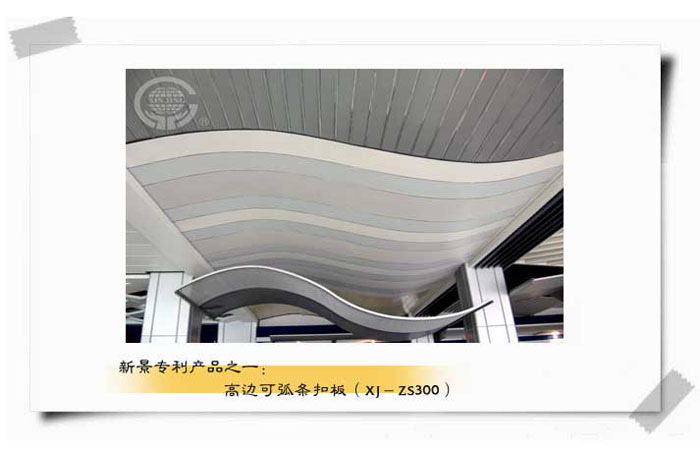 Widely used in various width strip ceilings and trimming, free to make wave-shaped changes, and make the appearance of a new sense, in the case of no cutting, can be used for free arc diameter of 1000mm, its advantages: can be on-site construction, For any parabolic decorative ceiling surface modeling, construction is simple, can have a sense of coordination with the shape of the ceiling arc surface, arc ceiling length can be produced to within the scope of 6000 × 600, reduce the connection point, so that the overall effect is more perfect, the company To apply for arc-shaped ceilings, any type of arc can be used as an aluminum chassis without having to relocate. The flexibility is strong, and the construction can be performed depending on the actual environment of the site. 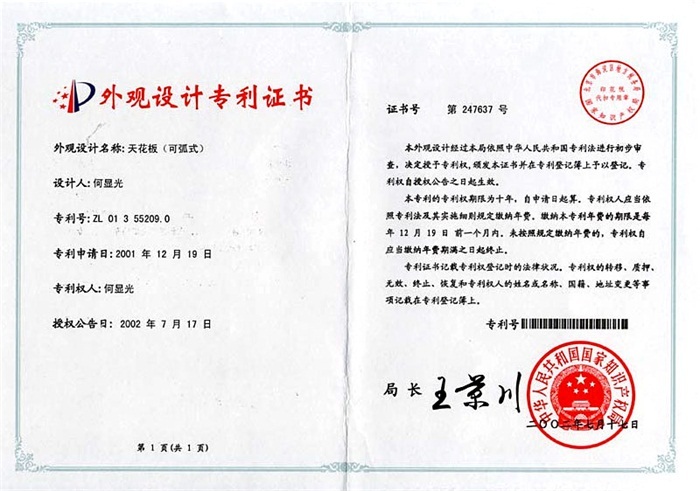 Compared with the old style, the use of material thickness, the old way to use the arc-shaped aluminum plate minimum 1.5--3m / m, and the need to add aluminum skeleton, and the company applies for patent arc products, the use of aluminum thickness only 0.5 ~ 1.m/m is sufficient. And can also significantly reduce the cost of the same appearance of the metal ceiling effect. Arbitrary arc type can be used as a base frame without having to be relocated, the hanging is simple, the construction can be visualized according to the actual environment of the site, the construction is convenient, the jointing method is extended, and the self-supporting ceiling structure is adopted, so that the board surface is firmly joined and the flatness is high. 1.Convenient construction: Under a uniform arc, a large area is used with about 12mm thick wood, saws into two pieces of the required shape or arc surface, and a 5mm plywood nail is used as a wood mold. Next, to avoid scratching the board surface) Put gloves on during construction and attach the new King patented arc plate to the wooden mold. Arrange the arc several times by hand or with a glue stick. (Due to the material elongation of the aluminum material, do not use it once. Forming, divided into multiple times, once the angle of bending is too large, there will be folding) until the arc can be close to the mold, you can install. 2. If the construction space permits, large-area use, it is recommended to install 38 # light steel keel supporting use, first in the top of the decorative finish to draw a cross-level ink line, put the boom position should be hit straight line hanging point, and install Good boom, (the boom point must be three points in a line and tightly fixed Luo Si, the main keel spacing 1.2 ~ 1.5M, supporting otherwise it will affect the overall installation decoration effect), the use of 38 # light steel keel can enhance the overall flatness The installation is safer and faster, as long as the 38 # keel is adjusted to a good level, with the special connection card code for this structure, and the 38# keel can be fastened. 3. The new King patented arc metal strip can be divided into two major types. A. Large arc can be arc, refers to the need to model arc radius of 1.5 meters or more, B. arc can be small arc, refers to the required arc Radius less than 1.5 meters, the difference between large arc arc and small arc can be used in the structure of the scale, the principle of retractable gate, telescoping position spacing is only, but in force, large Radial arc can use special keel spacing can be in the range of 800-1200mm, self-strength is relatively smaller than the small arc, but the arc can be small curvature in the arc shape, bending performance in small curvature arc can be higher However, since the strength is relatively lower than that of the large arc, the relative use of the special keel is more closely spaced. Please ask the customer to choose according to the actual situation. 4. The XJ-ZS300 type arcable aluminum buckle plate keel, according to the horizontal or arc drawn straight line and keel spacing (normal keel normal spacing of 0.8M) pay attention to the installation of the 38 # keel when the horizontal uniform, otherwise installed The effect of the arcable buckle ceiling is uneven. Note that the distance from the side of the keel should not exceed 15mm, otherwise it will affect the aesthetic appearance of the trimming.